The study aimed to find out whether fluorescence parameters of humic acids (HA), obtained from excitation-emission matrix (EEM) fluorescence spectra, could be used to explain the origin and properties of lake sediments organic matter. The research material was HA extracted from lake sediments. Sediment samples were collected in the summer stagnation, from maximum depth of each lake. Humic acids extraction was performed using the method proposed by the International Humic Substances Society. In extracted HA, the elemental composition, free radical content, UV-Vis, and EEM fluorescence spectra were determined. EEM spectral modeling was performed using a multidirectional statistical method—parallel factor analysis PARAFAC. Four specific, two protein-like (C2 and C4) and humic- and fulvic-like (C1 and C3) components, components responsible for emission of fluorescence were identified in HA extracted from lake sediments. In the obtained EEM spectra, the dominant component was C2, while the smallest participation have C4 component. The mean contribution of C3 and C1 components to the total intensity of fluorescence was almost the same and was about 25%. Significant correlations were obtained between the concentration of EEM components and parameters characterizing the chemical properties of sediments and humic acids. The study showed that the EEM fluorescence spectroscopy can be successfully used to characterize natural organic matter in aquatic environments. This method may provide supplementary information on the origin and transformation of organic matter in the water environments. By applying the parameters obtained from PARAFAC modeling, the relative degree of organic matter transformation (component C1) and autotrophic productivity (component C3) may be assessed. The analysis of the component C1 and C4 complete the information about the organic matter origin. Photoluminescent methods are significant tools to study natural organic matter (NOM) of various origins. The fluorescent method is the one which is commonly used to characterize and distinguish humic substances (HS) which are the main components of NOM. The reason for the prevalent use of this method is the fact that HS indicate photolumniescence under UV radiation and visible radiation as well. The method of fluorescent spectroscopy is so popular for its sensitivity as it enables the analysis of substances of low concentrations. It is also a nondestructive method (Senesi et al. 1991; Coble 1996; Mobed et al. 1996; Hautala et al. 2000; Alberts and Takács 2004; Sierra et al. 2005; Chen et al. 2002; Yu et al. 2012). It also provides an additional information on the HS molecules structure, inner-molecular energy transfer, as well as structural transformation (Senesi et al. 1991). Excitation-emission matrix (EEM) fluorescence spectroscopy, which records matrix excitation and emission spectra, has become a prevalent method to characterize OM originated from different environments. This technique provides the complex insight into all characteristic features within the range of a fluorescence spectrum and it also provides the exact picture of pairs of excitation and emission wavelengths, at which the investigated organic matter indicates maxim of the fluorescence. EEM fluorescence spectroscopy is used especially to study the properties of dissolved organic matter (DOM) in aquatic ecosystems (Coble 1996; Matthews et al. 1996; Mayer et al. 1999; Patel-Sorrentino et al. 2002; Stedmon et al. 2003; Chen et al. 2003; Yamashita and Tanoue 2004; Cilenti et al. 2005; Henderson et al. 2009; Kowalczuk et al. 2009, 2010; Yao et al. 2011; Ayah et al. 2015; Catalá et al. 2015; Chari et al. 2016). 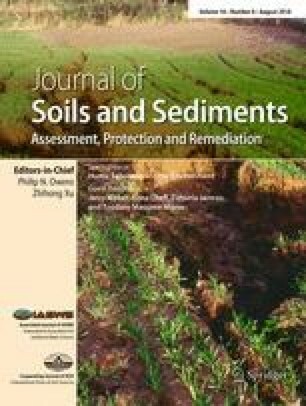 There are also available some results of studies in which EEM fluorescence spectroscopy was used for characteristics of HS extracted from soil and lake sediments (Mobed et al. 1996; Alberts and Takács 2004; Sierra et al. 2005; Tang et al. 2011; Derrien et al. 2017) and their interactions with trace metals and organic contaminants, as pesticides, endocrine disruptors, PAHs, etc. The EEM fluorescence spectroscopy is often used in studies on interactions of humic substances with organic pollutants (Fukushima et al. 1997; Provenzano et al. 2004; Plaza et al. 2006; Sun et al. 2007). The interpretation of EEM spectra of NOM has been done parallel with PARAFAC analysis (Stedmon et al. 2003; Kowalczuk et al. 2009; Murphy et al. 2013, 2014). It is a statistical approach to the modeling which enables characteristics and identification of fluorophores groups that are responsible for fluorescence emission. This technique is used to estimate similarities or the lack of them in the composition of the fluorescent groups. It is also used to estimate the differences between the samples. This approach provides additional information about optical properties of OM and their dynamic transformation in the natural environment (Cory and McKnight 2005; Stedmon and Markager 2005; Banaitis et al. 2006; Holbrook et al. 2006; Wedborg et al. 2007; Yamashita et al. 2008; Fellman et al. 2008; Ohno et al. 2008; Stedmon and Bro 2008; Santín et al. 2009; Murphy et al. 2010; Borisover et al. 2012; Wünsch et al. 2015). The biggest advantage of PARAFAC over the standard bilinear methods of distribution, such as principal components analysis (PCA), is its simplicity and ease of interpretation of results. Since PARAFAC modeling it has been possible to isolate the overlapping spectra of fluorescent components. It enables a display of some properties in the data set which are visually unclear and thus omitted while using traditional methods of interpretation. PARAFAC model enables isolation of exact spectra and concentrations of fluorophores present in the mixture of tested compounds even for uncalibrated spectra which contain factors inducing signal abnormality of analyzed substance (Murphy et al. 2010). The aim of the study was to assess the origin and properties of lake sediments OM, on the basis of optical properties of humic acids (HA). The studies were carried out on the material sampled from lobelia lakes situated on Pomeranian region. Lobelia lakes are among all European, natural glacial lakes the most unique and precious aquatic reservoirs with isoetid species (rooted aquatic plants with a short stalk and rosette of rigid, sycamore leaves): Lobelia dortmanna L., Isoetes lacustris L., and Littorella uniflora L. Myrophyllum alterniflorum L. belongs to indicator plants. Lobelia lakes are soft-water reservoirs, poor in mineral salts, characterized by low electrolytic conductivity and a high concentration of free carbon dioxide in water and bottom sediments (Szmeja 1997; Kraska and Piotrowicz 2000; Smolders et al. 2002). Lobelia lakes belong to disharmonious lakes. They are sensitive ecosystems. Pervasive degradation resulting in vanishing of lobelia flora has been observed in recent years. For this reason, the lakes are considered endangered ecosystems of pan-European significance. The investigated objects are characterized by high variability of morphological and hydrological parameters and the character of trophy (Table 1). The bottom sediments were sampled by means of a Kajak corer from the surface layer of the lakes up to 20 cm deep in summer stagnation. From each lake the sediments were sampled from profundal zone. Four to six random samples were mixed together to make one collective sample. Air-dry sediments were crashed in a mortar and sieved through a 1-mm mesh screen. The following parameters were determined: total organic carbon content (TOC) by Orlov and Grindel method and total nitrogen (TN) by Kiejdahl’s method. The results are shown in Table 2. Next, the HA were extracted from the air-dry sediments according to standard method recommended by the International Humic Substances Society (Swift 1996). The obtained HA were characterized by determining elemental composition of CHN/O using a model Elementar Vario EL III CHNS analyzer. Concentration of free radicals (FRC) was determined with Bruker EMX Spectrometer. HA from Leonardite was a standard pattern (Table 3). Optical properties of the studied HA were characterized by UV-Vis spectroscopy and fluorescence. UV-Vis absorption spectra were measured within the range of 220–700 nm using a double-beam spectrophotometer Specord M42 (Carl Zeiss-Jena). Quartz cuvettes with a path length of 1 cm were used in order to record UV-Vis spectra. Fl spectra were measured with a spectrofluorometer F-7000 (Hitachi). The recording of fluorescence spectra was performed in a reflection system in order to minimize the inner-filtering effect using a non-fluorescent quartz cuvette with path length of 1 cm. Three-dimensional Fl spectra (3-D Fl), which show the dependence of the intensity of emission on the excitation wavelength and the emission wavelength, were measured in the scanning mode of EEM. Scanning of emission wavelengths (Em) from 250 to 600 nm were performed by changing the excitation wavelengths (Ex) from 200 to 500 nm. The spectra were recorded with the scan speed of 1200 nm min−1. The band pass for excitation and emission was respectively 5 and 10 nm. The interval for emission and excitation was 10 nm. Normalization and calibration of the fluorescence spectra were performed according to the procedures introduced by Murphy et al. (2010). The spectral recording of absorption and fluorescence was performed at room temperature for the constant concentration of 10 mg CKH dm−3 in 0.05 mol dm−3 NaHCO3 solution. Each HA sample was pre-filtered through a syringe filter with 0.45 μm pore size. Coefficients which enable more detailed interpretation of the results were determined from both UV-Vis and EEM spectra. E4:E6, which is the ratio of absorbance at the wavelength of 465 nm to the absorbance at the wavelength of 665 nm (Chen et al. 1977), E2:E4, which is the ratio of absorbance at the wavelength of 280 nm to the absorbance at the wavelength of 465 nm and the spectral parameter ΔlogK, which is the difference of logarithms of absorbance at the wavelengths of 400 and 600 nm respectively (Kumada 1987) were calculated from UV-Vis spectra. The humification index HIX, which is the ratio of the integral intensity Fl within the wavelength of 435–480 nm to the integral intensity Fl within the wavelength of 330–345 nm at the excitation wavelength of 254 nm (Zsolnay et al. 1999) and biological index BIX, introduced by Huguet et al. (2009) and calculated on the basis of emission Fl excited at 320 nm as a ratio of Fl intensity at the wavelength of 380 nm to Fl intensity at the wavelength of 430 nm were determined from fluorescence spectra. Values of these parameters for the studied HA are given in Table 4.
where xijk is the intensity of Fl for the ith sample at emission wavelength j and excitation wavelength k; aif is an index directly proportional to the concentration of the fth analyte in the ith sample. The bjf is an index linearly related to the fluorescence quantum efficiency (fraction of absorbed energy emitted as Fl) of the fth analyte at emission wavelength j. Likewise, ckf is an index linearly proportional to the specific absorption coefficient at excitation wavelength k. The f index defines the number of components in the model, and the residual matrix eijk represents variability not explained by the model (Table 5). The spectral curves of HA provide information not only about the structure of HA but also about the presence of particular chromophore groups, the sizes of HA molecules or the progress of the humification process (Stevenson 1982; Kumada 1987; Uyguner and Bekbolet 2005; Fasurová and Pospíšilová 2010; Reddy et al. 2014). E4:E6 is the most popular and common ratio used to characterize HA. According to Chen et al. (1977), the ratio reflects the size of HA molecules and the content of COOH. Some authors use the parameter to determine the degree of aromacity or humification of HA (Sequi et al. 1991). For the tested HA, the values of E4:E6 ranged within 2.6–4.8 which is characteristic of the large-sized molecules of a strongly cross-linked structure. Kumada (1987) introduced an additional parameter ΔlogK which reflects the degree of humification. The increase in the degree of humification results in the decrease in ΔlogK values. According to Kumada the ΔlogK values up to 0.6 relate to a high degree of humification, from 0.6 to 0.8 medium, and from 0.8 to 1.1 to a low degree of humification. For the tested HA, the ΔlogK values ranged within 0.5–0.8, which indicates their average degree of humification. E2:E4 is used as an indicator of the presence of the structure characteristic in the early stage of humification. It may also reflect the contribution of allochthonic OM in relation to autochthonic OM. For the tested HA the values ranged within 4.6–6.7 which indicate the predominant contribution of OM of autochtonic origin and smaller contribution of hard-degradable lignin/cellulose fragmentations. Tryptophan-like and tyrosine-like structures are the factors which are usually observed in EEM spectra. EEM fluorescence also enables ones to distinguish indicators of microbiological activity and humic-like structures of both allochtonic and autochtonic origin (Coble 1996; Baker and Curry 2004; Hur and Kim 2009; Carstea et al. 2010). The pairs of excitation wavelengths are specific for each component. As a result of PARAFAC modeling, four specific components (C1, C2, C3, and C4) present in all studied HA were identified. The four groups of fluorophores emit Fl in different spectrum areas in dependence on character and origin of the tested material. The excitation and emission spectra of individual components indicated by PARAFAC model are presented in Fig. 1. The position of excitation and emission maxima of individual components in the Fl spectra of HA samples found with the PARAFAC model is shifted towards shorter wavelengths compared to the generally accepted ranges. According to Coble (1996), such a shift in the shortwave direction is characteristic for the samples derived from freshwater sources. The occurrence of Fl maxima in the shortwave range is related, among others, with the presence of the heterogeneous molecularly components, of a simple structure and a low molecular weight. It is also connected with the reduction of the number of chromophores with conjugated bonds and a slight degree of humification. Component C2 was the dominating component in the obtained EEM Fl spectra of HA, while the contribution of C4 was the smallest and most diverse (Fig. 2). The presence of C2 is probably a result of the presence of tyrosine-like aminoacid derivatives (free or embedded in protein structures) within the HA structure. The component C4 can be a combination of two different fluorophores. Like the component C2, the component C4 may indicate the contribution of labile protein structures which may be the product of decomposition of the plant matter as well as bacterial (Zhou et al. 2013; Wang et al. 2017). A statistically significant correlation between C2 and C4 components (r = 0.61, p < 0.05) was obtained. Tryptophan, which is responsible for most of the proteins and shows the maxima in the same spectral region, seems to be the most likely source of this emission (Baker and Genty 1999). The presence of C2 and C4 fluorophores is often exhibited in dissolved OM (Stedmon et al. 2003), especially in HS fractions with higher nitrogen contribution (Knicker 2004; Sierra et al. 2005). In the KH extracted from lobelia lakes, the relative concentration of tyrosine-like components of C2 was generally higher than the C4 components of tryptophan derivatives. This may indicate a low degree of transformation of tested HA. The labile protein-like components can occur in HA by interacting with other organic molecules, and as such they can be protected from microbial degradation (Knicker 2004; Yamashita and Tanoue 2004; Santín et al. 2009). The protected protein fragments in the HA structure provide these compounds with their own enzymatic activity (Gołębiowska and Miklewska 1991). C1 and C3 components are attributed to humic-like substances (Stedmon et al. 2003; Kowalczuk et al. 2009). These components have two excitation maxima and a single emission maximum, particularly noticeable for the C3 component. This arrangement is attributed to the fulvic-like and humic-like structures of the soluble OM derived from estuary samples (Yamashita et al. 2008; Hassouna et al. 2010). In addition, component C1 and C3 represent fluorophores associated with poorly transformed humus-like material, with a high contribution of fresh material likely to be of terrestrial origin (Coble 1996). The mean contribution of humic- and fulvic-like fluorophores to the total Fl intensity of the tested HA was almost the same and it was about 25% (Fig. 2). Cory and McKnight (2005) state that C1 and C3 components have similar characteristics to semiquinone molecules, and therefore, the researchers think that MO fluorescence may be at least partially attributed to quinone-like fluorophores. As it is known, free radicals and phenolic structures are considered important groups contributing to the Fl phenomenon of humic substances (Ghosh and Schnitzer 1988). The positive correlation between the concentration of component C1 and the concentration of semichinon free radicals, obtained in the studies, may partially confirm the hypotheses presented by the mentioned above authors. As it is known, the concentration of stable free radicals in the HA structure is an evidence of the degree of transformation identified with the specific degree of humic acid humification. The higher the concentration of free radicals in the HA molecule, the higher the degree of humification HA (Milori et al. 2002; Rosa et al. 2005; Ferreira et al. 2013). The number of semichinon structures contained in the HA structure is related to the intensity of the oxidation processes involved in their transformation. The higher concentration of the C1 component with the increase of free radicals indicates a relatively higher degree of intra-molecular transformation. However, there is no such dependence for the C3 component. Bottom sediments are integral components of lake ecosystems. Properties of HS, which are the integral parts of OM deposited in sediments, are important indicators of the changes undergoing in the ecosystems. The HS due to their complex nature, their specific chemical composition and high reactivity may indicate the main sources of OM as well as the biogeochemical paths of the transformation. Using lake bottom sediments to evaluate OM in terms of its origin, the degree of transformation, or to evaluate relative primary productivity and lake trophy requires a variety of technical geochemical methods. The evaluation may be performed or completed successfully with the use of spectral analysis EEM Fl. Among the four isolated components, C4, which is connected with Fl through the structures of microbiological origin, seems to be the most distinguishing one for the tested HA. The occurrence of C4 in EEM Fl spectra may be a kind of “finger print” which makes identification of HA coming from lake sediments in terms of their origin easier. The correlation between the concentration of C4 and other parameters characterizing the origin of OM:TOC:TN in sediments, C:N and % N in HA is statistically significant (Fig. 3a). It is known that TOC:TN ratio is used as an indicator of the OM origin (Meyers 2003, 2006; Khodse et al. 2008; Mielnik 2009) and/or the indicator of intensity of denudative processes whose role is to supply the aquatic reservoir with extraneous (allochtonic) mineral matter (Lobbes et al. 2000). Similarly, the C:N ratio in HA may be used as an indicator of OM origin (Mielnik 2009) as a basic criterion of classification of sediments (Hakanson and Jansson 1983). Values of TOC:TN and C:N ratios are determined by the composition of plants whose residuals are deposited at the bottom of a lake. Sediments containing OM from land usually indicate higher values of TOC:TN and C:N (cellulose and lignin, which are the main component of plant detritus, contain little amount of nitrogen) whereas lower values of TOC:TN and C:N are characteristic of OM of autochtonic origin, which contains significant concentrations of nitrogen. The increase in concentration of C4 with the increase in C:N ratio and the decrease in concentration of N in HA molecule may be an evidence that C4 is also a good indicator of HA humification. The low contribution of C4 to fluorescence of the tested HA may be an evidence of smaller contribution of OM of allochtonic origin, which is characterized by high resistance to microbiological degradation, in relation to OM of autochtonic origin in the sediments of investigated lakes. Positive correlation between C4 and the parameters determined from UV-Vis spectra E4:E6 and ΔlogK (Fig. 3a) confirms the conclusions. Higher values of these parameters are characteristic of fresh material of relatively short time of deposition, a lower degree of humification and a less-condensed structure. Protein-like fluophores were observed in the EEM spectra of poorly humified fractions of HA and FA extracted from sediments and soils (Sierra et al. 2005). The presence of protein-like components in HS may indicate the low degree of humification of the studied organic matter. It corresponds to the results of the research carried out on natural OM in coastal environments, where unstable poorly humified fractions of OM are predominant (Santín et al. 2009). The occurrence and concentration of component C4 in HA derived from lake sediments may complement the information about the origin and the degree of transformation deposited OM (Yamashita and Tanoue 2004; Carstea et al. 2010). The speed of sedimentation and indirectly the properties of sediments are determined by primary production. The primary production may be evaluated on the basis of, among others, organic carbon content, and/or the content of opal—amorphous silica mostly of biological origin in which diatoms and phytolytes are rich (Borówka 2007). Biological productivity may also be evaluated on the basis of the changes of BIX, introduced by Huguet et al. (2009). The significant correlation between the values of BIX and the ratio C:N and percentage contribution of N to HA was confirmed in the paper. The substances rich in nitrogen with low ratio of C:N are trophically more valuable and used first what results in the increase of biological production in a lake. Statistically significant correlation between concentration of C3 and the ratio C:N in HA and BIX (Fig. 3b) also was obtained which confirms the important role of nitrogen in transformations of OM in aquatic environment. Nitrogen is a specific regulator of processes undergoing in HS. The relative increase in N content in HA macromolecule may cause bigger primary production and bigger contribution of autochtonic OM to bottom sediments. Besides, the significant correlation between C3 and E2:E4 ratio was obtained (Fig. 3b). As A280 determines the content of lignin-type compounds in HS and A465 determines the content of HS in the initial stage of decomposition, the analysis of E2:E4 enables evaluation of the relative contribution of the autochtonic OM in relation to the land fraction/part (Li and Hur 2017). Thus the increase in concentration of C3 means bigger contribution of autochtonic, rich in nitrogen OM which is conducive to biological activity. An interesting parameter allowing to conclude on the degree of internal transformation appears to the C1 component. Component C1 seems to be an interesting parameter as it provides information about a degree of inner transformation. The significant positive correlation between C1 and the concentration of free radicals and index HIX was obtained (Fig. 3c). Both parameters may provide information about a degree of inner transformation of OM structures. It means that these parameters are connected with the progress of humification. Twenty-five percent contribution of C1 to total fluorescence indicates small contribution of HA which are characterized by relatively bigger transformation of hard-degradable and more aromatic structures. The component C1 is also negatively correlated with BIX index, introduced by Huguet et al. (2009) as the parameter of recent autochthonous contribution (Fig. 3c). The authors think that the HIX and BIX parameters are suitable for DOM origin determining. The values HIX < 4 and BIX > 1 are characteristic for organic matter of autochthonous origin, primarily biological, or aquatic bacterial origin (Huguet et al. 2009). The obtained correlations between the C1 component and the HIX and BIX indexes indicate that the C1 component can be also successfully used to completing the inference about the OM origin. Four specific, two protein-like, humic-like, and fulvic-like, components responsible for emission of fluorescence were identified in HA extracted from lake bottom sediments. The results showed that OM present in the bottom sediments from sampled lakes has autochtonic provenance and consists of mostly labil organic compounds. The isolated components may be a kind of indicators useful for describing processes and changes undergoing in the lake environment. They may identify main sources of OM and conditions in which its properties form. The component C4 may be “finger print” which makes the identification of OM in terms of its origin easier. The component C3 may characterize the speed and amount of the primary production. The analysis of the component C1 may complete the information about a degree of inner transformation of the structure forming OM and the advancement of humification process. EEM fluorescence spectroscopy using a PARAFAC modeling can be successfully used to characterize natural OM in aquatic environments. This method provides additional information on the optical properties of humic substances and their transformation dynamics in the natural environment.